increasing requirement for a high powered cross-country vehicle with large passenger and cargo carrying capacity. The main feature of the 6x6 being that by increasing both the load carrying capacity and area, the third driven axle increases, if not improves, the cross-country ability accordingly. 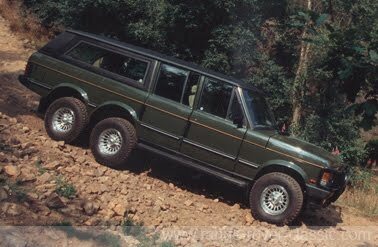 An extension, in total of 935 mm (37"), is added to the basic Range Rover chassis to facilitate the fitting of the third axle. All material is equivalent in thickness and shape to the standard Rover chassis, being electrically welded to a high standard. In all cases, wherever a cut is made, the chassis is boxed or plated internally, thereby ensuring that more than adequate strength is added to the chassis frame. 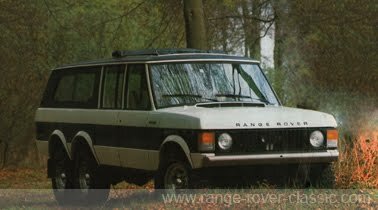 Additional brackets, cross-members, suspension parts and fittings are all standard Rover items. The main requirement being, throughout the vehicle, to maintain uniformity and therefore provide ease of repair and maintenance. The chassis extension and third axle provides a considerable increase in load area and carrying capacity. vacuum operated, lockable differential. The design of this axle now offers permanent six wheel drive in both high and low transfer, but by incorporation of the differential between the third axle and vehicle gear box, the possibility of "wind-up" is eliminated. However, over extremely arduous conditions the differential in the new axle in conjunction with the standard gearbox differential can be engaged, thus locking the drive together from front to rear. The Majority of parts used in the axle and drive line are standard or modified Rover items, with all gears cut to Rover specification, thus ensuring ease of maintenance. 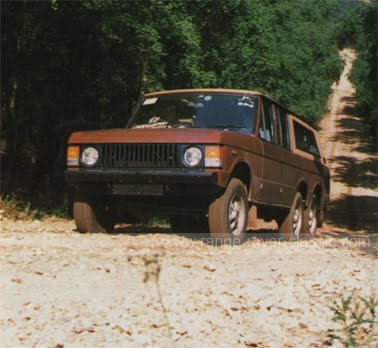 The Range Rover 6x6 body offers five doors, four forward and one horizontally split at the rear. 99% of all parts used are either standard or modified Rover items and when assembled, form a body of the highest standard. However, as with all our products, we are capable and willing to adapt, modify or redesign the vehicle. Specialist bodies can be built to carry or incorporate various types of equipment to suit customers specific requirements. The interior can be re-trimmed and re-styled in a variety of materials. Special paint finishes can be provided and numerous internal and external extras fitted. Engine: V.8 all aluminium. O.H.V. water cooled. Capacity: 3528 cc. Max. B.H.P. (DIN): 130at 5000 R.P.M. Max. Torque (DIN): 25.6 kg. m. (185 lb. ft) at 2,500 R.P.M. No. of cylinders: 8. Compression ratio: 8.5:1. Cooling system: Pressurised with pump. Gearbox: Manual. Speeds: 4 forward 1 reverse (synchromesh all forward). Ratios: Top Direct. Third 1.505:1. Second: 2.448:1. First: 4.069:1. Reverse: 3.664:1. Transfer Box: Two speed reduction on main gearbox output front and rear 4 wheel drive permanently engaged via lockable differential. Floor mounted high/neutral/low speed change lever. Differential locked by vacuum control from gearbox mounted switch. 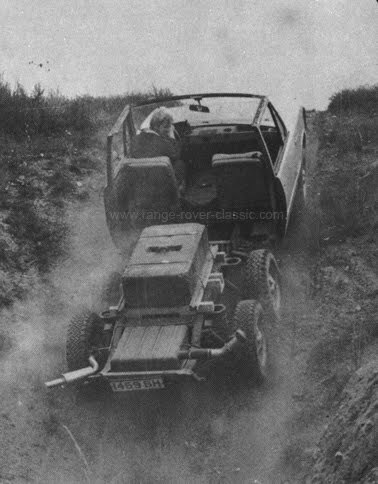 Chassis: Welded box section chassis frame similar to Land Rover, with an additional 935 mm (37") extension behind second axle. Front Axle: Spiral bevel, enclosed c.v. universal joints. Differential ratio: 3.54:1. Second Axle: 'Scottorn' through-drive silent chain, spiral bevel. Lockable differential, engaged/disengaged and differential locked by vacuum control from gearbox mounted switch. Differential ratio: 3.54:1. Third Axle: Spiral bevel. Fully floating shafts. Differential ratio: 3.54:1. Front Suspension: Live axle with coil springs, radius arms and panhard rod. Rear Suspension 1 and 2: Live axle with coil springs, radius arms, "A" frame location arms and Boge Hydromat self energizing levelling device. Shock Absorbers: Hydraulic, telescopic, double acting. Brakes: Servo assisted, dual operation. Front: Disc 11.75" (298 mm) diameter. Rear: Disc 11.42" (290 mm) diameter. Hand Brake: 7.25" (184 mm) diameter, 3" (76 mm) wide duo-servo drum brake on rear of transfer box. Electrical System: 12 volt negative earth. Fuel System: Rear mounted 86 litre (19 gallon) petrol tank. Pump: Mechanical. Carburettors: Twin Zenith-Stromberg. Wheels: Pressed steel. Size: 6.00 JK x 16. Studs: 5 per wheel. M16x 1.5 thread. Firestone Town & Country Radials 205 x 16 (tubed). The design of the axle is such that it allows for two, four or six wheel drive with two optional differential locks, both in high or low transfer. However, it was considered that the combinations available far exceeded the requirement during operation. Therefore, the options available have been limited and future vehicles now offer the following drive methods. 1. Low Range: Six wheel drive permanent. Paired differential locks optional. 2. High Range: Six wheel drive permanent. Paired differential locks optional. The majority of parts are standard or modified Rover Company items. All gears are cut to conform to the Rover Company module. The power take-off facility remains available.